UCLA engineers and scientists have engineered a type of synthetic protein—a chimeric antigen receptor, or CAR, that responds to soluble protein targets. The advance shows great promise for helping the body's immune system seek out and destroy cancer because it could boost the effectiveness of immunotherapies against solid tumors that are otherwise highly resistant to the body's immune response. "We have generated the first example of a CAR that can help white blood cells—specifically T cells—convert tumor-produced proteins from suppressants, or 'downers' for our immune system, into stimulants that trigger robust attacks on the tumor cells," said Yvonne Chen, the study's principal investigator, and an assistant professor of chemical and biomolecular engineering at the UCLA Samueli School of Engineering. "This could lead to new therapeutic applications, particularly in the treatment of solid tumors." Solid tumors—tumors that grow as masses in the body—are difficult to destroy because they have a variety of defenses, including an ability to secrete proteins that disable the immune system. Overcoming those defenses has been a major focus of cancer biology research. One promising method for doing that is CAR-modified T-cell therapy. In 2017, the FDA approved such therapies to treat blood cancers, such as leukemia or lymphoma. However, CAR-modified T-cell therapy has not been as successful for treating solid tumors. The immune system naturally seeks out diseased or infected cells that could harm the body. On the surfaces of those cells are proteins called antigens. Meanwhile, T cells—white blood cells that can destroy abnormal cells—have corresponding proteins, called receptors, that can recognize and bind to specific antigens. When that binding occurs, it triggers a series of chemical and biophysical processes that activate the T cell to neutralize the harmful cells. Solid tumors have the ability to secrete soluble proteins called immunosuppressive cytokines, which inactivate immune cells, including T cells. This creates a microenvironment that is highly hostile to immune cells and protects the tumor. Based on that knowledge, the researchers hypothesized that they could overcome that defense mechanism by altering the T cells' response to the immunosuppressive cytokines. Instead of shutting down, the engineered T cells would react to the cytokines by mounting an attack on the tumor cells. Scientists knew that CAR signaling can trigger T-cell activation and anti-tumor effects, so the researchers proposed engineering CARs on the T cells to signal in response to immunosuppressive cytokines. However, CARs normally respond to antigens presented on the surface of cells, not to antigens that float around in the environment. The researchers discovered how to engineer CARs that could respond not only to surface-bound antigens, but also to soluble proteins, including immunosuppressive cytokines. The researchers placed the CARs they developed on T cells, and the modified T cells became activated in response to soluble antigens. The new approach enabled T cells to convert the cancer's own defense mechanism into a weapon that could intensify the immune system's attack on tumor cells. 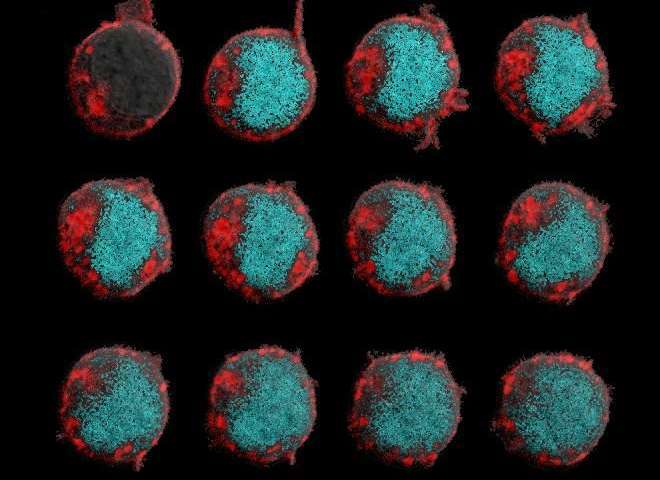 The researchers also discovered that, in order for a T cell to activate, two of the CARs on its surface must both bind to a single soluble protein. And they demonstrated the versatility of their approach by engineering CARs that responded to several different soluble proteins, including transforming growth factor beta, or TGF-beta, a potent immunosuppressive cytokine. TGF-beta could be one target for future immunotherapies to treat cancer.